A group campaigning for the restoration of old county boundaries is threatening to remove road signs in County Durham. Countywatch is targeting signs south of the county where changes were made for the formation of Cleveland. It says this is a response to concern over the relocating of signs from the traditional border of the River Tees to the Darlington authority boundary. 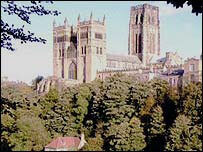 However, Durham County Council say any attempt at removal would amount to nothing more than vandalism. Countywatch believes historic boundaries have been eroded by the creation of metropolitan boroughs and unitary authorities, and the group has removed signs in other counties. Tony Bennett, secretary of Countywatch, said: "We were contacted by Durham residents who were hopping mad that the council had recently relocated signs from the traditional boundary between Durham and Yorkshire and relocated them to the Darlington boundary. "So on Friday we will be travelling around Durham looking to see whether signs are on the correct, true border. If not, we will remove them carefully and re-erect them on suitable posts along the River Tees." He added that the group's actions were not illegal because Section 131 of the Highways Act 1980 permits the public to remove signs "not lawfully placed on the highway", and these are not be lawfully placed as they do not mark the true boundary. However, in a statement Durham County Council said: "The county council has statutory powers to erect these signs under the Traffic Sign Regulations and General Directions 2002, and does so to assist the general public, particularly those visiting the county. "Countywatch has no powers whatsoever to remove them and no matter how they dress up their actions to justify what they do, it amounts to nothing more than sheer vandalism, no less mindless or anti-social than smashing-up bus stops or telephone boxes."